Just because you can’t afford to feed your guests sushi or Kobe beef doesn’t mean you can’t throw a great party with memorable food. 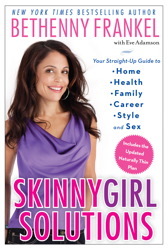 In Skinnygirl Solutions, I show you what to serve, and how to serve it. Just as important: learn what not to serve. Always remember your theme or tone when you choose your food. Don’t mix it up. 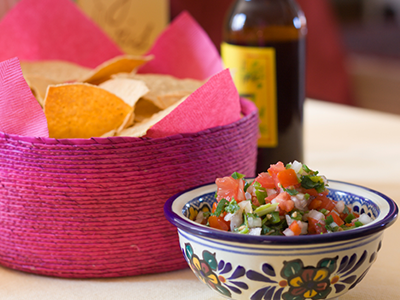 A table with hummus and pita chips next to spinach dip next to salsa and guacamole is all over the place. Choose a lane, or at least put like foods together and separate them from other types of food. A Middle Eastern–style cluster could include hummus, feta, baba ghanoush, cucumber-yogurt dip, and skewers of chicken or lamb. On a different table or in a different room, an Italian spread could include antipasti, mini mozzarellas, olives, and rosemary crackers. An Asian mix could include Japanese rice crackers, wasabi peas, edamame, and tamari almonds. This doesn’t mean the whole party has to be about one type of food, but don’t have a mishmosh all clumped together. • Any kind of make-your-own bar is fun. Try a burger, taco, pizza, or ice cream bar. • Pesto lasagna and baked ziti are easy to make and inexpensive. • Do a few things well. You don’t need forty-two bowls of pretzels and tortilla chips and potato chips. If you have fewer, higher-quality foods, your party will feel more designed and elegant, and it will cost less. • Pasta is an inexpensive way to feed a crowd and it feels fancy if you serve different shapes and colors. Try whole wheat, spinach, and beet pastas. Fresh seasonal ingredients combined with olive oil, lemon, garlic, and fresh herbs make it more upscale. Try shredding fresh basil over pasta. In the summer, add tomato, cucumber, and corn, or some feta cheese, fresh parsley, and pine nuts. Choose toppings that are good hot but won’t be terrible when they get cold. • For a big dinner party, use a kid’s chalkboard and write the menu on it, so guests feel like they are in a restaurant. Or buy cheap frames and print the menu on your computer. You can also put out these frames at the bar, naming the signature cocktails and explaining what is in them. Little details like this make a big impact. • Even for a sit-down dinner, everything doesn’t have to be white-glove fancy. Mix your nice crystal glasses with fun colorful plates or serving platters. • Never serve chips or dips in the bags or jars. It costs nothing to put them into nice bowls you already have. • Keep your food looking good. Always be busing, wiping up, and replenishing. To me, nothing is worse than dirty glasses and plates sitting around. I’ve been to very fancy parties and seen bowls with guacamole and ranch dressing dripping over the sides and a bunch of crappy crumbled chip pieces in them: Don’t let your food table get ratty and disgusting. A clean, attractive spread of inexpensive food is much more inviting than a messy, gross presentation of expensive food. • Consider how your food will look after an hour and choose foods that won’t get disgusting. Dip in a bowl gets disgusting. It’s very 1982. Baked brie looks great for five seconds, but then it sits out and gets gelatinous and sloppy. • If you live in or near the country, collect wildflowers or natural greenery instead of buying flowers, for a rustic feel. Sunflowers are a great choice. Big bowls of lemons and limes also add rustic ambience, especially to an outdoor party. • You can find super-inexpensive party décor and supplies at dollar stores.